It seems as if there are few, if any, short-term solutions or tools that can aid in addressing the opioid and heroin epidemic threatening Frederick County and areas across the country. Overdoses all too frequently result in severe medical emergencies or deaths. However, a medication that is rapidly gaining acceptance nationwide as a first response solution in opioid overdose situations is naloxone. Naloxone (often sold under the brand name Narcan©) reverses the effects of opioids in one’s system. It helps prevent fatal overdoses by binding to opioid receptors in the brain and restoring normal breathing function to someone whose breathing has become shallow or has stopped as a result of using an opioid— either heroin or prescription pain medication. 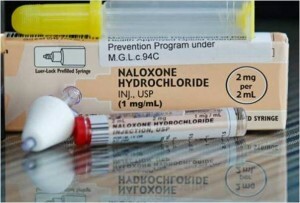 Naloxone comes in liquid form and can be administered in several ways: by injection, IV, or even sprayed in the nose. One of naloxone’s greatest advantages is the speed at which it goes to work. It can begin restoring regular breathing in as little as two minutes after administration and can continue to stabilize a person’s condition for up to 90 minutes. Another advantage of Naloxone is that it has no potential to lead to addiction and cannot be abused or used to feel “high.” The only effect it has is to restore breathing during an opioid overdose. That must serve as a caution also: the medication only works when an opioid is in a person’s system. If an overdose involves another type of substance, Naloxone will not affect a person’s breathing. 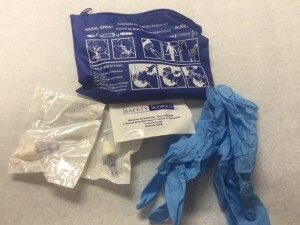 Overdose prevention rescue materials (Naloxone). 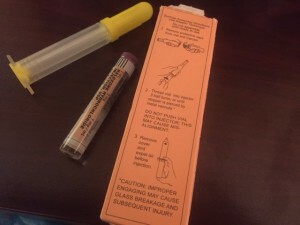 Emergency medical personnel, police officers, and other first responders are often trained on how to administer Naloxone. Thanks to recently passed legislation in Maryland, those who can administer Naloxone has expanded. Family members of individuals struggling with addiction and others who may have an opportunity to rescue someone experiencing an opioid overdose can also learn how to administer the drug so that they are prepared in the event of an overdose emergency. Frederick County residents can receive free information and training onresponding to an opioid overdose, which includes seeking medical help and administering Naloxone at the Frederick County Health Department. Kits with Naloxone doses are available with all necessary tools included. Awareness of naloxone is growing in Maryland. The 2015 Maryland Public Opinion Survey on Opioids included a question about Naloxone, and over 60% of respondents indicated that they were aware of it. About 43% of people knew that Naloxone was used to reverse the effects of opioid overdose while 21% thought it was for heroin overdoses only. Remember, opioids not only include heroin, but also prescription pain medication. The survey also revealed that 35% of participants did not know what Naloxone was used for, so further education and awareness is still needed across the state. 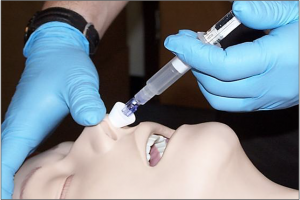 Naloxone administered by spraying in the nose. While Maryland residents are becoming more knowledgeable about Naloxone, the fact remains that opioid and heroin abuse is still a serious public health issue. A total of 1,039 drug- and alcohol-related intoxication deaths occurred in Maryland in 2014, a 21% increase over the number of deaths in 2013, and a 60% increase since 2010. 7% of all intoxication deaths that occurred in Maryland in 2014 were opioid-based; these included deaths related to heroin, prescription opioids, and non-pharmaceutical fentanyl. Also in 2014, Frederick County reported 26 deaths by heroin overdose, 9 related to prescription opioids, and 6 directly correlated to fentanyl. Help spread the word in your community about Naloxone. It may save a life—and start someone on the path to recovery. If you or someone you know in Frederick County, Maryland is struggling with opioid dependence issues, please contact the Frederick County Health Department at 301-600-1755 or call 2-1-1 for help and treatment options 24 hours a day, 7 days a week. Airtime and other charges may apply for cell phone users. Mobile users may also call 1-866-411-6803.